Tamara Carrera, CAC Executive Director and CEO, left, and Sandy Springs Mayor Rusty Paul cut the ribbon on CAC’s new facility. City leaders and community supporters celebrated the expansion of CAC at a Building Dedication & Open House on May 1, 2018. The new facility at 8607 Roswell Road will allow CAC to serve more residents in need of assistance and allow for the expansion programs designed to promote self-sufficiency. Sandy Springs Mayor Rusty Paul cut the ribbon with Tamara Carrera, CAC Executive Director and CEO. Rabbi Ron Segal of Temple Sinai delivered the invocation followed by keynote speaker Milton Litton, President of the United Way of Greater Atlanta. Dan Brown of Dunwoody United Methodist Church issued the closing prayer. Guests were provided with guided tours around the building to learn about how services are provided to neighbors in need. Four areas of the building were named for donors who chose a naming opportunity as part of their Building Hope Campaign gifts. Laura DeLong, a past CAC board member, president and volunteer, dedicated the break room to all volunteers. Mount Vernon Presbyterian Church honored Carol Beckman, a long-time volunteer and liaison to the church that originally housed CAC, while Northside Hospital and Mercedes-Benz USA also made naming gifts. 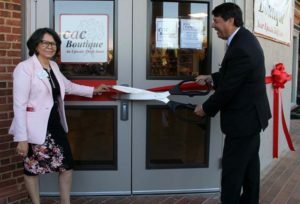 Following CAC’s purchase and renovations of the building at 8607 Roswell Road, the 14,000 square foot facility is now complete and houses the CAC Boutique thrift shop and the CAC food pantry, that provide food and clothing to local individuals and families in need. With the basic needs services of food and clothing operating out of the Roswell Road building, CAC will now build upon the promotion of self-sufficiency piece of the nonprofit’s mission with expansion of the adult education program and the addition of a career center at 1130 Hightower Trail. The Hightower building will also be used to manage season programs like school supplies and Adopt-a-Family. Client interviews for assistance remains at Hightower as do the business offices. Additional future CAC expansion plans to reach more neighbors in need call for opening a satellite office in south Sandy Springs, a second satellite in Dunwoody and a community garden to generate fresh produce and community engagement.